Please Note - Absolute Poker does not accept USA players. Please check our poker review page for a complete list of all poker rooms or our best US poker sites page for details on which poker rooms accept American players. 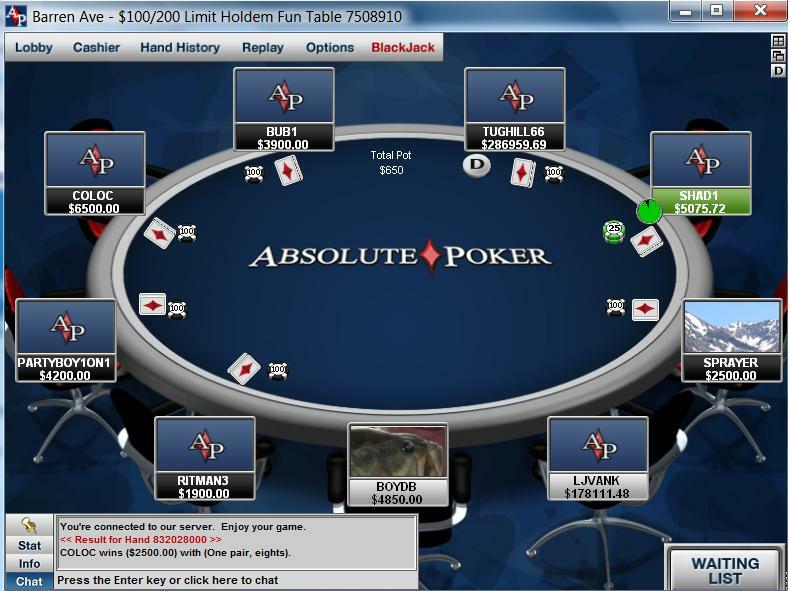 Absolute Poker (www.AbsolutePoker.com) is one of the large sites in online poker. The poker site was established in 2003 and remained a relatively small poker site until 2006. That year, Absolute Poker merged with Ultimate Bet to create the CEREUS Network. Since then, Absolute has grown to become one of the leaders in online poker. Absolute Poker is one of our favorite online poker sites, due to their solid player traffic, excellent player promotions, and vast variety of deposit and withdrawal options. Since Absolute joined the CEREUS network they have taken their game to a whole new level, and we proudly endorse their site. Plus, Absolute is currently running a special promotion for all BestPokerSites.org visitors - sign up with referral code PSITEORGAP, and automatically receive a 150% up to $500 bonus on your first deposit (details later). for a 150% up to $500 Bonus! Various improvements over the years have brought Absolute Poker to the forefront of online poker sites. A busy tournament schedule and player traffic at all stakes make it a pleasure to play at Absolute Poker. If you’re in the market for a new online poker site, Absolute Poker is always a good choice. Absolute Poker gives all new players a 150% deposit bonus on their first deposit if they use the referral code PSITEORGAP when signing up for an account. This referral code works for all new players who sign up and make a deposit at Absolute Poker. The maximum bonus is $500, which should provide a nice boost to the bankroll. You’ll have sixty days to clear as much of the bonus as possible. The money is released in increments of $5.00 as you play in ring games and tournaments at Absolute Poker. Any money that you release is yours to keep or cash out as you please, but if you cash out before clearing your entire bonus you will forfeit any remaining bonus money. For more information, read our full analysis of the Absolute Poker bonuses and promotions. The Absolute Poker lobby is designed to make it easy to sort through all the different types of tournaments, sit and gos, and cash games. Once you log in to your Absolute Poker account, you can set up various filters to show you only the types of games you’re interested in. Beyond that, you can also set up a variety of options at the tables themselves. Players can set up four color decks, auto-rebuys and more. As player traffic has increased over the years, so have Absolute Poker’s tournament offerings. Multi table tournaments and sit and gos are held around the clock at Absolute Poker at stakes that range from tiny to ultra high. The largest tournament at Absolute Poker is the weekly $200,000 Guarantee. Absolute Poker guarantees that this tournament will never have a prize pool of less than $200,000, even if they have to kick in extra money. Sit-n-go tournaments are also popular at Absolute Poker. Players can choose from a variety of single table SNGs, multi-table SNGs and heads up SNGs at all stakes. Players can also play in satellite SNG tournaments in which the prize for winning is a free entry ticket to a larger, more expensive tournament. Player traffic at Absolute Poker has increased significantly since the big merger of 2006. They now regularly have several thousand active players logged in and playing at all stakes. Cash game tables are busy at stakes that range from the penny tables on up to the highest stakes on the internet. The tournament scene is also lively at Absolute Poker. Many players join their tournaments every day and the prize pools can be quite significant. The $200K guarantee is always a popular one, but you can find tournaments running all week long here. As the player base continues to grow, we can expect to see more great things from Absolute Poker. Absolute Poker has a long list of deposit options that are open to both US and non-US players alike. Credit cards are the most commonly used deposit method, but there are many more beyond that. There are dozens of deposit options to choose from, so getting started is always easy. Cashouts are usually processed via the same manner used to deposit. Players who deposit with credit cards will have to choose a different withdrawal method because most credit cards do not accept reverse transactions. Customer support at Absolute Poker is adequate but not outstanding. The main problem is that the only contact method is e-mail. The good news is that the AP support team works 24 hours a day and replies to e-mails quickly. If you have any issues, they’ll take care of you. But still, it would be nice to see 24 hour phone support. Ready to Play? Visit Absolute Poker to Get Started Now! Now that you know everything there is to know about AbsolutePoker.com's poker room, it's time to get started. Visit Absolute Poker and use referral code PSITEORGAP automatically receive our exclusive 150% up to $500 sign up bonus.